San Francisco, CA, September 29, 2014 – VIZ Media, LLC (VIZ Media), the largest distributor and licensor of manga and anime in North America, and ReedPOP, the largest producer of pop culture events in the world, are proud to welcome one of Japan’s preeminent manga artists – Takeshi Obata – for his first-ever U.S. personal appearance. His visit is co-presented by The Japan Foundation. The acclaimed artist of smash hit manga (graphic novel) series such as DEATH NOTE, BAKUMAN?, HIKARU NO GO, RAL?GRAD and ALL YOU NEED IS KILL will appear at several events during the 2014 New York Comic Con. Taking place October 9th– 12th at the Jacob Javits Convention Center, New York Comic Con is the East Coast’s biggest pop culture convention. Full details on the show are available at: www.NewYorkComicCon.com. During the convention, Takeshi Obata will appear in person on two panels, on Thursday October 9th as part of VIZ Media’s WEEKLY SHONEN JUMP panel and on Friday October 10th with an overview of his incredible catalog of works. He will make an exclusive signing appearance at the Javits Convention Center on Thursday evening. Takeshi Obata will also make a pair of additional appearances around New York as part of ReedPOP’s New York Super Week on Friday October 10th at Kinokuniya Book Store and Saturday October 11th at Barnes & Noble. Fans are invited to stop by the VIZ Media Booth (#1944) on Thursday October 9th for details and to secure advance tickets for the exclusive New York Comic Con Takeshi Obata signing, taking place the same day at 7:30pm at the Javits Center. Signing tickets will be distributed on a first come/first served basis promptly at 1:00pm and again at 4:30pm. (There will be no advance line-up until 15 minutes before ticket time). Each attendee that secures a ticket will receive an exclusive shikishi signing board that Obata will autograph. Fans may also select from a wide array of Obata manga titles available for purchase at the VIZ Media booth, including special advance copies of his newest work, ALL YOU NEED IS KILL, a deluxe omnibus manga treatment of the Hiroshi Sakurazaka’s hit sci-fi novel that inspired the action blockbuster Edge of Tomorrow starring Tom Cruise. It will debut under VIZ Media’s Shonen Jump Advanced imprint on November 4th. Other acclaimed Obata manga titles including DEATH NOTE, BAKUMAN?, HIKARU NO GO and RAL?GRAD will also be available for purchase. Join the staff of VIZ Media’s WEEKLY SHONEN JUMP as well as editors from Japan’s Weekly Shonen Jump magazine to welcome Takeshi Obata for an enlightening personal discussion on what’s new and what’s next for the long-running manga anthology which launched best-selling titles such as NARUTO, BLEACH, ONE PIECE, DRAGON BALL as well as Obata’s BAKUMAN?and DEATH NOTE series. Join special guest Takeshi Obata along with his editor, Koji Yoshida, for an insightful conversation about Obata’s beginnings as an artist, his extensive history working in the manga industry, and the creative process behind his works. Don’t miss this extraordinary opportunity! Takeshi Obata also will participate in a pair of special off-site signings as part of New York Super Week. New York Super Week takes place October 3rd – 12th immediately preceding New York Comic Con and is a unique immersive pop culture event where the entire island of Manhattan becomes a playground for a colorful array of superheroes, villains, cosplayers, artists, celebrities and passionate fans of from all over the world that gather to take part in a variety of themed events all over the City including concerts, comedy shows, gaming events, lectures, podcasts, storytelling, food tastings. Takeshi Obata was born in 1969 in Niigata, Japan and is the artist of the wildly popular SHONEN JUMP manga series DEATH NOTE, BAKUMAN?and HIKARU NO GO (all published by VIZ Media). He is the winner of the 2003 Tezuka Osamu Cultural Prize’s Shinsei “New Hope” Award and the 2000 Shogakukan Manga Award. 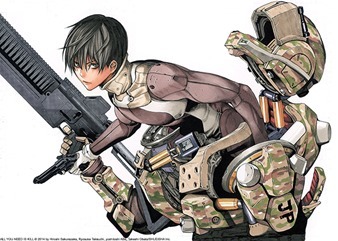 Obata is also the artist of Arabian Majin Bokentan Lamp Lamp, Ayatsuri Sakon, Cyborg Jichan G., and his newest manga work, the sci-fi action series ALL YOU NEED IS KILL, which is based on Hiroshi Sakurazaka’s best-selling novel. For more information on Takeshi Obata’s manga titles or other manga titles published by VIZ Media, please visit www.VIZ.com.